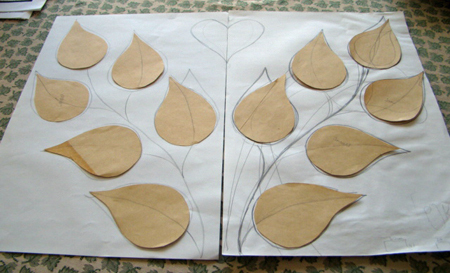 I've made up my mind on a leaf shape so now it's time to put it on paper. It is the leaf shape I always start drawing if I'm doodling. A brown paper envelope from the morning post and a pencil and I'm away. One bigger, one smaller and perhaps one just the right size. I decide to cut out twelve and lay them on paper to see if they will have enough room. A bit of trial and error with drawing a stem shape and I have my sketch. A space in the middle is just crying out for a heart. I have always been creative in one way or another but have never been part of a group like this and I am just loving it so it seems so appropriate to have a heart. Thanks Robin for pointing me in the direction of http://lisabinkley.typepad.com. Wow. I can't imagine how my first finished leaf will look like yet. I think the colours will be inspired by the bright yellow of the winter jasmine in the garden. January is my birthday month and often as well as a time of reflection it is a time when I look forward with optimism to the things I might do in the year ahead so bright yellow seems a good idea at the moment. We shall see. The slight hitch to this plan is I have no yellow beads. So you know what I will be doing next. Your design is very appealing to me-I love leaves. I'll be waiting to see what you do. Thanks for commenting on my blog. Thanks Sandy. I can't wait to get started. What a wonderful idea!!! I am still trying to decide what to do for my shape. I have so much to learn!! I love the idea of drawing out a final design to become a cohesive completed work of art! Thanks for the encouragement. I too am looking forward to learning new stitches. I like! You have given me an idea for how to use my shapes (butterflies... now all I need to do is find a suitable backing fabric! What a lovely shape to choose. I think I'm going to make some felt for my background. Super idea/drawing, Evanna! Glad you had time to visit Lisa's site... aren't the wonderful? Yours will be too... I love the idea of combining them into one piece. Yellow for January sounds just right! Thanks Robin. 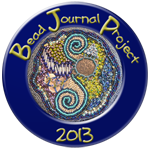 Hopefully will get to the bead shop at the weekend.